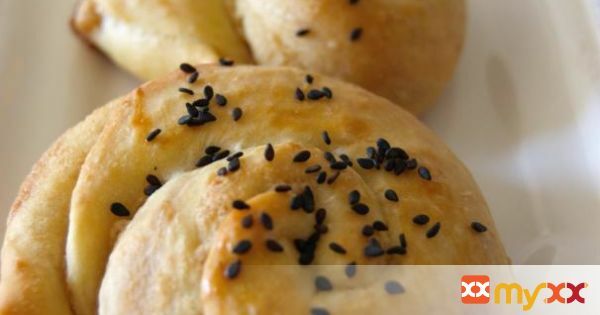 Armenian tahini rolls - snacks good for anytime of the day. 1. Pre heat oven to 325F. 2. Combine flour, sugar, yeast, and salt in a bowl. 3. In a small bowl combine egg and oil. 4. Warm up the milk. 5. Add the milk to the flour mixture, then add in the egg mixture to make a smooth, elastic and not sticky dough. If sticky add more flour. 6. Cover with a damp cloth and let it rest for 30 minutes. The dough won’t rise like other bread doughs, so don’t worry. 7. Divide the dough into 12 pieces, cover and let them sit for around 20 minutes. 8. Roll one ball of dough out to a very wide thin circle. 9. Spread a thin layer of the tahini mixture. 10. Starting at the longest edge, roll up the dough into a rope. Holding one end of the rope, start folding up so it makes a coiled bun. 11. Gently flatten the bun with the rolling pin or with your hand. Place on a greased or lined baking sheet. 12. Repeat with the remaining dough. 13. Brush the rolls with the beaten egg, then sprinkle a few sesame seeds over top. 14. Bake 25-30 minutes or until light brown. 15. Enjoy. Keep them in air tight containers. They taste good by themselves or smear them with butter.